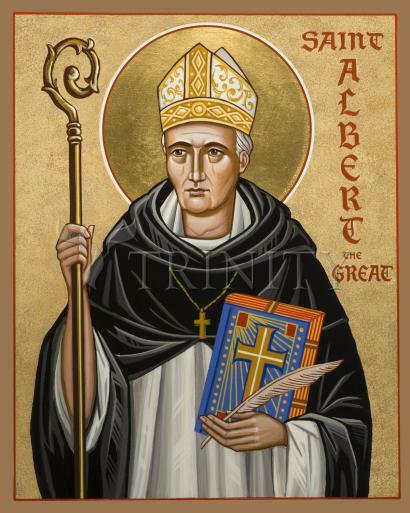 St. Albert was known as the "teacher of everything there is to know," was a scientist long before the age of science, was considered a wizard and magician in his own lifetime, and became the teacher and mentor of that other remarkable mind of his time, St. Thomas Aquinas. He was born in Lauingen on the Danube, near Ulm, Germany; his father was a military lord in the army of Emperor Frederick II. As a young man Albert studied at the University of Padua and there fell under the spell of Blessed Jordan of Saxony, the Dominican who made the rounds of the universities of Europe drawing the best young men of the universities into the Dominicans. Albert was born in Swabia - a region that now contains Stuttgart, Germany - around 1200. He studied at the University of Padua and the University of Paris, which then was the intellectual center of western Europe. He joined the Dominican Order and became the first German Dominican friar to receive a master of theology degree.